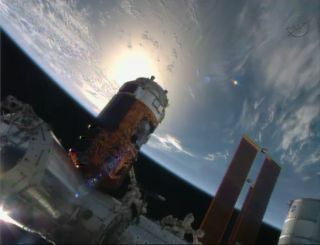 The HTV-4 (Kounotori 4) cargo ship built by Japan's space agency is in docking position at International Space Station in this still from a NASA TV broadcast on Aug. 9, 2013. The spacecraft carried just over 3.5 tons of supplies to the station's crew. A Japanese spacecraft — named after a white stork because of the important delivery it needed to make — safely arrived at the International Space Station Friday (Aug. 9) with a robot and several tons of supplies on board. NASA astronaut Karen Nyberg used the station's robotic arm to nab the cargo ship HTV-4 Kounotori at 7:22 a.m. EDT (1122 GMT). The capture took place as the orbiting complex flew 260 miles (418 kilometers) over waters just south of South Africa. The Expedition 36 crew then berthed the ship to the station's Harmony node at 11:38 a.m. EDT (1538 GMT). Kirobo only stands about 13.4 inches (34 centimeters) tall. Image posted June 27, 2013. Onboard Kounotori was a talking robotic astronaut, Kirobo, who will be a companion to veteran Japanese astronaut Koichi Wakata when he arrives at station in November or December. "I want to help create a world where humans and robots can live together," Kirobo said when Toyota Motor Corp., a partner in the project, asked the robot what its dream is. The robot is expected to speak on station for the first time in August or September. One of Kirobo's long-term aims is to help monitor the mental health of astronauts during grueling long-duration space missions. Time on the space station — although rewarding professionally — is sometimes tough on astronauts personally because they are living in an isolated, dangerous environment far from friends and family. On Saturday, the crew began unloading the 3.6 tons of cargo on the spacecraft. This included fresh food, water and supplies for the humans on station, as well as several components to keep the orbiting outpost's electrical system functioning. Also on board were several research experiments, a new freezer that can keep samples at temperatures below -90 degrees Fahrenheit (-68 degrees Celsius), four CubeSat satellites and hardware for the station to run more robotic refueling demonstration tests to investigate the feasibility of servicing satellites in orbit.